Paul Krugman of the New York Times finished first in Trump's newly released Fake News list. Krugman had claimed the Stock Market would never recover from Trump being elected president. ABC's Brian Ross took second with his false story that Trump had ordered Security Adviser Flynn to make contact with the Russians. Ross was fired by ABC over his story. Mainstream Media is sinking to new lows in Journalism. It's not really journalism anymore as much as an unofficial propaganda wing. 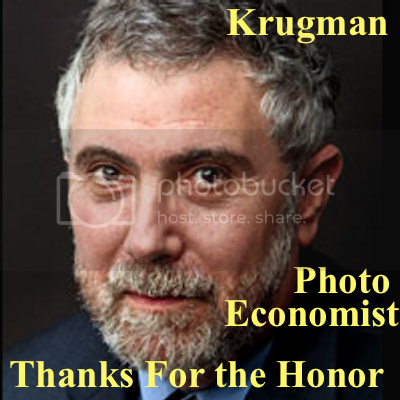 Krugman?s opinion piece took first place? Journalism ain't what it use to be. Look at all the incredible mistakes CNN is making in reporting. Where have all the Woodward and Bernsteins gone? Krugman victoriously claimed the economy would completely tank under Trump. He might know economics, but he's incapable of objectivity due to his staunch partisan views. Check what he said a couple days later about it...and what the repercussions were. It?s sad we have a president that would rather make gossip lists than actually govern the country. You?d think he?d have more important issues to tackle. But, this petty crap makes his base happy and he loves attention. Remember when Obama filled out a NCAA bracket and the right wing nut jobs lost their mind? Are the Democrats declaring war on overweight people? What does that have to do with the subject? No, its about the lie. The graphic someone posted shows a bloated Trump. I think Democrats are going in a bad direction making fun of overweight people. So if someone drew a thin muscular Obama that would mean they?re making fun of fit people or is it just an accurate caricature? Generally, overweight people are often the target of ridicule. Overweight people do not consider it funny. Overweight isn?t the funny part, it?s the ego driven need to lie about it that?s funny. It?ll all go away Ray...don?t worry. But since you brought it up I?ll repeat your question, what does this have to do with the subject? But since you brought it up I?ll repeat your question, what does this have to do with the subject?? It's not hard to figure it out. Criticizing Trump for being overweight could be argued as acceptable (Though a significant part of the American public is overweight); but, using exaggerated drawings of an obese Trump is a little crude. People are dealing with the topic differently. I saw a commercial the other day encouraging women with weight problems. Obese women are tired of seeing skinny females being glamorized. Fat drawings of Trump are belittling to many people with weight problems. You don't have to be a Republican to be offended. I know Democrats with weight problems. I wouldn?t want to be lumped in with trump either...I?ll tell the cartoonists they can only draw trump as he isn?t. I wouldn?t want to be lumped in with trump either...I?ll tell the cartoonists they can only draw trump as he isn?t.? You still don't get it!! Sorry, I think I explained it fairly well. 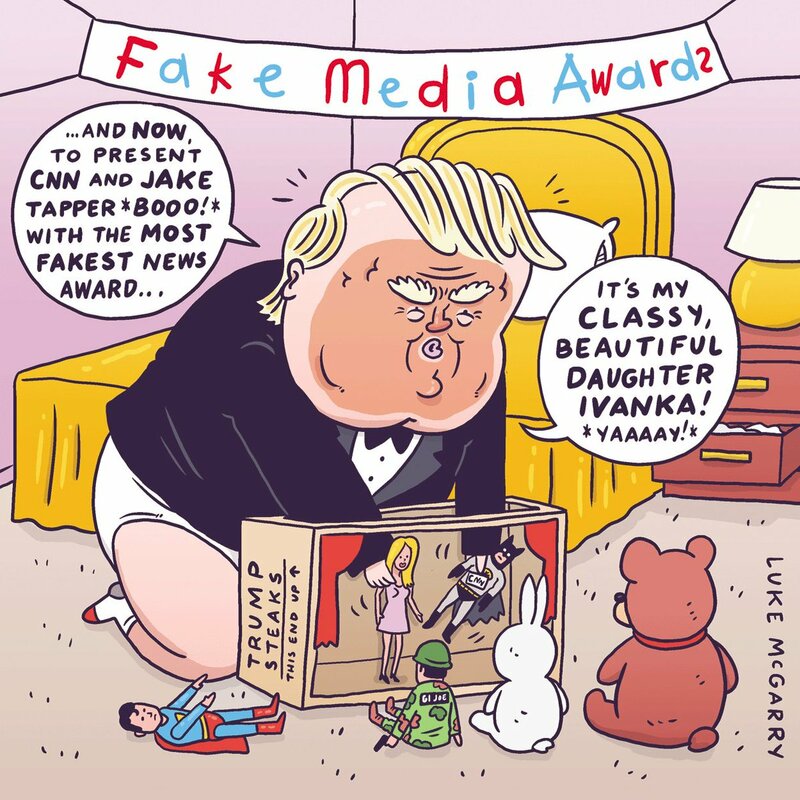 The topic is his ?fake media awards?...you derailed it. Carry on. the real winner of the fake news would be trump who forces his own daughter in law to broadcast regularly on his behalf. the real winner of the fake news would be trump who forces his own daughter in law to broadcast regularly on his behalf.? Does that mean Obama would be a candidate for fake news by having his wife involved in his politics? Second Place For ABC's Brian Ross is not bad. There are two views of the awards. Some people say they will hurt reporters. But, some say the awards will improve reporting (Which is what I believe). You might be surprised with how many people are concerned with a declining media. Im overweight and I consider the cartoon funny. The web site crashed from the number of people trying to get to the results. By the way, I'm a little surprised Mark would use a graphic about Trump and ISIS. One of the great accomplishments under Trump is the destruction of ISIS. That's not what his memes tell him. The ignorant memes do the thinking for Wayne. fuzz, you're not really comparing Prolix with markie, are you? Only when he feels threatened LOL. Still.. he usually comes up with something that makes some sense- fuzz isn't stupid- THAT comparison is stupid! lol! Where did I compare anyone to mark?